When I got engaged I immediately got myself calligraphy supplies. I thought that invitation envelopes would be the perfect project to finally get me to learn. I love calligraphy so very much and had always wanted to learn. But month after month, that sad stack of supplies sat at my desk gathering dust. I had lots of time, I kept telling myself. There was no rush. But secretly, I was thinking, "You'll never be good at it. Look at your sloppy handwriting. You may as well not even try." Even as the wedding loomed ever nearer, I could not manage to overcome my fear of being terrible at it. Finally, about two and a half months before the wedding the time for procrastination had passed. Long passed. If I wanted to do this thing, I had to do it. I sat down at my desk one afternoon, pushed my keyboard out of the way and just started. It was every bit as bad as I'd feared. Within minutes my hands were smeared with ink, and the pure white desktop was splattered. The writing was bad. Beyond bad. A toddler just learning how to write could probably have done better. It freed me. And with that simple change in my way of thinking, I was hooked. Day after day I spent hours working on my calligraphy. Sometimes as many as six hours a night. I'd write until my wrist ached, take a break and then start again. I'd wake up in the morning to find ink on my face. I wrecked many a shirt before I started just wearing black so I wouldn't stain everything I owned. And every time I felt like I was the worst calligrapher that ever lived, I would just repeat to myself, "Well, you can't get any worse at this." It was my mantra. It reminded me that so long as I kept putting in the effort the very act of practicing meant progress. Practice didn't mean perfect. It never would. But if I kept at it I would improve. 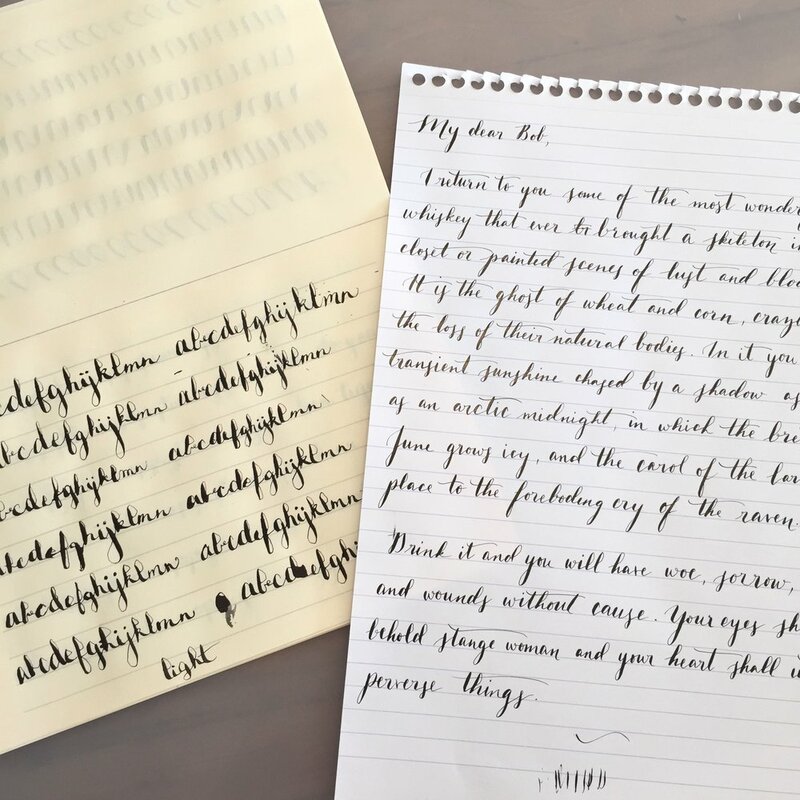 Even if, when I finally needed to address those envelopes for my wedding invitations my calligraphy was not as beautiful as I wanted, I would be better if I just kept going. I filled up notebook after notebook. I would spend a night just writing the letter A, in capital then lowercase, then B, then C. I would write pangram after pangram. "Forsaking monastic tradition twelve jovial friars gave up their vocation for a questionable existence on the flying trapeze." I liked that one best because it was long and I could imagine the story so vividly. This was essential when I was writing the same sentence for hours. Those jovial friars kept me company. I found a website filled with letters from famous people. I rewrote them. Van Gogh. Napoleon. Beethoven. And then finally, the day arrived. My invitations had arrived. Their blank envelopes were the goal I'd been working so hard towards. There was no more time to practice. I spent one whole Saturday addressing. I just went through my guest list, one by one. Everything was set aside to dry, then added to either the "Good Enough" pile or the "Redo" Pile. I redid a few, bu not as many as I thought I would need to. And then they went out. Into the mail and into the world. They did not have the stunning precise calligraphy that I admired on instagram, but they were personal and represented a huge hurdle I had overcome. Even now, looking back I can see the flaws, but it's certainly not all I see. And I continue to practice. Perhaps not quite as diligently as I did before I sent out those invitations. But, if you ever come to my place for dinner, you can certainly expect some totally unnecessary calligraphy place cards. I'm not letting all this hard work go to waste.